Can You Listen To the Silence Between the Notes? 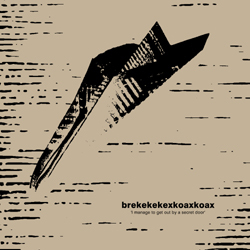 (Sea of Tranquility) Brekekekexkoaxkoax is an ongoing experimental vehicle for multi-instrumentalist Josh Ronsen's minimalist, improvised music. I manage to get out by a secret door is compiled from six separate sessions recorded between 2002-2006 that find him performing his prepared guitar and various electronics in a solo, duo, trio and quartet configuration. The first two compositions are strictly improvised, abstract pieces of music that combine Ronsen's plethora of prepared guitar which basically consists of his percussive plunking and scraping along with the odd belch of feedback, with drummer Jason Pierce's almost distant sounding percussion work. These two tracks which clock in at almost twenty and sixteen minutes respectively are long, drawn out collages that don't rely that much on actual musical notes, just sound. The same can certainly be said for the third track "Shoham" which features Ronsen on what amounts to six and a half minutes of electronic drone. Thankfully things start to finally open up a bit sonically by the fourth composition "We ought to have but one single thought" as the unit expands to a trio. With the added instrumentation the tones begin to also feel distinctly warmer as Ronsen and second guitarist Glen Nuckolls provide a thick cocoon of pulsating sound overtop drummer Genevieve Walsh's furious brush strokes. "Art brings a tiny gleam, swamped by garruiousness" is once again a solo foray for more of Ronsen's drawn out electronic textures, which unfortunately kills off some of the momentum built up from the previous track. The disc concludes with "These are mere words, powerless, useless", the only composition recorded in a quartet, and a track that once again works due to the infusion of added instrumentation, which comes by way of the slightly distorted sounding wind instruments such as oboe, flute and clarinet. I manage to get out by a secret door will certainly prove to be a challenging listening experience especially for people who lean towards more conventional sounding, instrumental music. Inevitably it won't appeal to everyone. As a whole I think the results on I manage to get out by a secret door could have been better, due to the fact that the two solo electronic pieces not only sound out of place here but they don't really have much to offer. The true promise of musical fireworks is only hinted at when Ronsen expands the unit, thus expanding the sonic capabilities of the music as well, unfortunately though this doesn't occur nearly as often as one might hope. (Bad Alchemy) Quoth the Raven: brekekekexkoaxkoax. Diesen Kr�chzer von Namen hat sich Josh Ronsen gew�hlt. Auf I manage to get out by a secret door (eh?35, CD-R) breitet er ein Spektrum seiner Improvisationsgel�ste aus - solo mit nur Electronics oder mit Turntable, Guitar & Electronics. Die EGitarre, meist pr�pariert gespielt, ist sein Hauptwerkzeug, in Duos mit dem Drummer Jason Pierce, zu dritt mit Glen Nuckolls an der akustischen Gitarre und Genevieve Walsh an Drums & Fl�te, und schlie�lich noch zu viert mit zus�tzlich Jacob Green an Percussion, Electronics & Oboe. Auf der Agenda stehen Dumitrescueske Drones und Ger�uschnuancen, mit viel Fingerspitzengef�hl hervor gekitzelt, perkussives Rascheln und Knistern und Klimpern, drahtig gezupftes Saitenspiel, Entstehungsort ist Austin, TX. Ronsen sammelt dort Informationen �ber John Cage, das Schnurren von Katzen und Songs aus m�glichst jedem Land der Welt (Germany - Fehlanzeige) und er schreibt am experimental music + mail art zine Monk Mink Pink Punk (issue 12 - 07/07 enth�lt z.B. Interviews mit Eric Cordier und Keith Rowe). Bei seiner Improvisiererei habe ich den Eindruck, dass immerhin den dr�hnenden Soli und dem Trio, bevor die Drummerin ein Juckreiz bef�llt, ein ansprechender Flow gl�ckt. � 2014 Public Eyesore Records. All Rights Reserved.